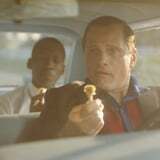 Academy Award winner Mahershala Ali stars as Dr. Don Shirley, a world-class black pianist, who hires Tony Lip (Academy Award nominee Viggo Mortensen), a Bronx-born bouncer, to drive him on a concert tour that extends from Manhattan to the Deep South. Using the "Green Book," which serves as a guide to the establishments that were safe at the time for African-Americans, the pair navigate the ups and downs of their lengthy road trip together. In our exclusive (and pretty funny) clip above, you'll get a glimpse of the unlikely friendship that blossoms between the real-life duo. Check it out, and then see all the other movies we're excited about this Fall.